Even under dark skies and away from urban light pollution, we can only see about 4,000 stars with our unaided eyes. There are thousands more stars to see, visible using simple binoculars, and many more than that with telescopes, whether small backyard versions or giant telescopes on mountaintop observatories or in orbit.. Binoculars are a fantastic and affordable way to explore the night skies, and they are easy to carry and have a wider field of vision than a telescope, making them excellent to keep your bearings among the constellations as you learn the sky. You can even find image-stabilized binoculars, which remove the hassle of shaking arms or need for a tripod. Just push a button and the electronics make all the stars stop shaking! Although star maps, star guide books and planispheres are useful tools to find your way to find objects in the skies, there are powerful new tools to find our way around the skies and to identify planets, constellations, satellites and other intriguing objects: the smart phone. There are many apps which can turn your smartphone into a portable planetarium, overlaying constellations and labels over your view through the phone’s camera. Below are several that work well, but a quick internet search will uncover many with different features. Try them out and see which one works best for you – they can put the Galaxy at your fingertips! Just one word of warning… make sure to use the night sky setting to turn your phone’s screen to a red color to preserve your night vision from the bright white light from your phone. Once you lose your night vision, it can take many minutes to return even after just a quick glance at the screen. 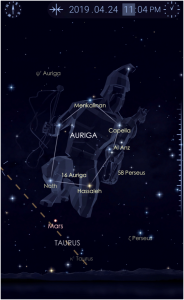 Star Walk 2 (for Apple iOS) – uses your device’s GPS and camera to overlay celestial information on the real sky. Identifies stars, planets, and even the International Space Station and meteor showers. Night Sky (for Apple iOS) – similar to Star Walk 2, uses augmented reality (AR) to identify celestial objects quickly and easily. 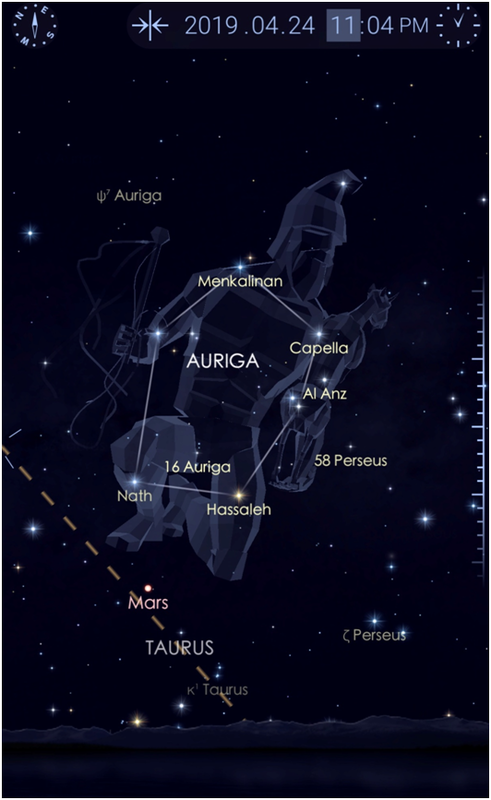 A sample image from the Star Walk 2 app, showing Mars and Auriga setting in the west. These events are visible from Manitoba on the date(s) indicated. All times are given in Central Daylight Time, the local time for all of Manitoba. April 5 : New Moon. A New Moon is a great time of the month to stargaze, as the bright Moon will not block our view of the dimmer stars or other night sky objects. April 6th (evening): The Manitoba Museum’s Planetarium & Science Gallery host their annual Yuri’s Night event as part of a worldwide space party which celebrates the first human spaceflight. 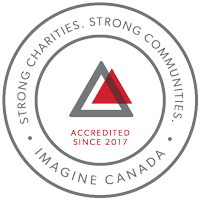 Event details and tickets here. April 9 (evening sky): The crescent Moon and the red planet Mars are close together in the western sky as dusk fades (about 10 p.m. local time). Both objects are in the constellations Taurus, and both should fit within the field of view of a standard pair of binoculars. They will remain visible as they slowly sink towards the western horizon, setting about 1 a.m. Mars will remain in this portion of the sky for a while, but by tomorrow night the Moon will have moved eastward in its orbit around the earth. April 12 (evening sky): The first quarter Moon will be prominent in the evening sky, setting around midnight. At this time in its monthly cycle of phases, it appears almost exactly half illuminated. April 19 (all night): Full Moon. At this time in its monthly cycle of phases, the Moon lies almost directly opposite the Sun in the sky, placing it high above the horizon for much of the night. The full moons in a year are often given names according to the seasons in which they fall. This month’s full moon will be the second to fall in the spring of 2019 – the Milk Moon. For more information on the Moon’s cycle of phases and its orbit around earth, visit In-The-Sky.org. April 21-22 (morning of April 22): The annual Lyrids meteor shower peaks on this night in the hours before dawn. The Lyrids are a minor meteor shower, only producing about a dozen meteors per hour on most nights. This year, the brightness of the nearly-full moon will spoil much of the view. What meteors you do see will appear to radiate from the area near the bright star Vega in the constellation Lyra, from which the shower gets its name. Approximately a quarter of Lyrid meteors will leave a brief train of ionized air behind them, looking like a smoke train that fades away in a few seconds. For further information, visit the International Meteor Organization. April 23 (morning sky): The waning gibbous moon is very close to Jupiter in the sky as the pair rises after midnight. As the night goes on, the two objects will rise higher into the southeastern sky, but the Moon’s motion will carry it closer to Jupiter hour by hour. By the time dawn brightens the eastern sky, Jupiter and the Moon will be only about 1 degree apart – that’s two moon diameters, or the apparent width of your index finger when held out at arms’ length. You’ll see them both with your unaided eye, binoculars, or a telescope with a low-power eyepiece. This is a highlight of the month for viewing solar system objects, so it’s well worth getting up early for! April 25 (morning sky): The waning gibbous moon is near Saturn in the sky. Saturn is not as bright as Jupiter, but still outshines most of the nearby stars, glowing a pale golden color to the Moon’s upper left. April 26 (morning sky): The last quarter Moon shines in the morning sky, rising about 1 a.m. This is another time in the moon’s monthly cycle of phases when it appears almost exactly half illuminated, but it is the opposite “half” compared to first quarter moon two weeks ago.